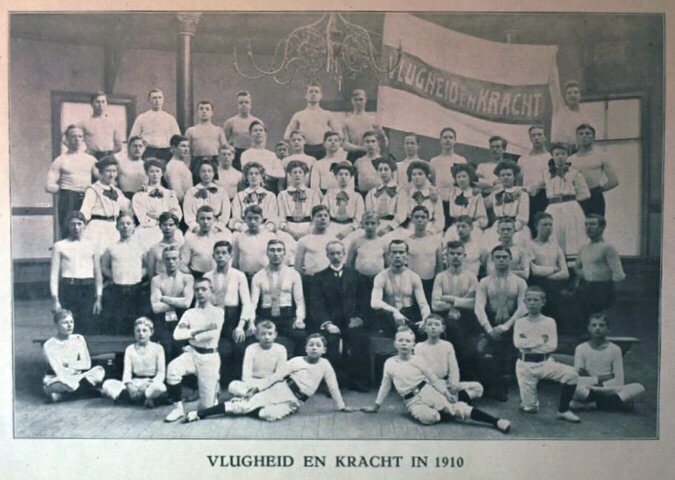 Sportassociation Vlugheid en Kracht founded in 1904 at Groningen. This is a short piece of information for foreign visitors of this website. Currently, all content on the site is in Dutch. In the future certain parts will become available in English. If you want information concerning playing sports at our association, the best way is to contact us through e-mail. It is always possible to try out a sport a few times without further obligations. If you are indifferent about surfing the site in Dutch, just follow the links on the left and top to do so. Or go visit the Sitemap to look around. Vlugheid en Kracht which means literally 'Promptitude and Strength' was founded on the 6th of september 1904 by a bunch of men, in the town of Groningen (northern part of the Netherlands). The most important objective of the association was shortening conscription. Conscription took up to 24 months then, but could be shortened considerably (4 months) if you could prove by means of an exam to have certain skills and a good physical condition. It was then decided to improve the physical condition by founding the fence- and gymnastics association Vlugheid en Kracht to avoid long conscription. Through the years the association became one of the largest sport associations in the town of Groningen. During this periode of growth several new activities arose, like athletics and hand ball. In 1953 a disposal arose in the association between the departments gymnastics and hand ball, eventually leading to a junction of the association. At a very emotional member meeting it was decided as of then to continue as two separate associations, the gymnastics association Vlugheid en Kracht and the hand ball association Vlugheid en Kracht. Meanwhile the hand ball association has merged with another association and is called now Vlugheid & Sparta. But the gymnastics association Vlugheid en Kracht still exists, in spite of the fact that we have known difficult periods too. Depth point was nevertheless end 1989. At that moment only 60 members where still about and a governing board of 2 persons. A couple of people have put their shoulders under this association then. Consequence of this effort has been eventual that we are now a recreational omni sport association with such 150 active members. Volleyball, 55+sports, fitness, floorball and bommen (moving on music) currently are our most important activities. Because of waning interest the decision was taken in 2001 to stop with one of the main activities (gymnastics). Because of the lack of volunteers in 2002, after 78 volumes (provisional) an end has come to our association booklet 'de vlugheidbode'. Fortunately the stick could be passed on to this Internet site, promoting it to association booklet thus. The association celebrated its 100th jubilee with all kinds of particular activities in 2004. As from September 2005 Vlugheid en Kracht is still expanding with new activities like floorball. We are still alive... and kicking!